The IsoPlane imaging spectrometers, available from Princeton Instruments, set new standards of performance and versatility. The IsoPlane-320 is the most excellent imaging spectrometer in its class. It achieves maximum throughput and signal-to-noise performance with fast f/4.6 optics and exceptional image quality. A unique optical design entirely eliminates astigmatism across the focal plane and provides better multichannel capabilities. There is simply nothing compared to the patented, multi-award–winning IsoPlane-320. 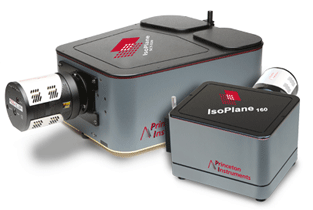 The IsoPlane-160, also offered by Princeton Instruments, is a compact 200 mm imaging spectrometer. It features an excellent imaging performance, unique astigmatism-corrected optical design, fast f/3.88 optics, and spectral resolution that rivals most 1/3 m Czerny-Turner (CT) spectrometers. The IsoPlane-160 is the best-in-class spectrometer that provides all of this performance and versatility in a compact design.